To get their brains in gear, Abbie and Ichabod are playing a game while trying to interpret Grace’s (Abbie’s ancestor) journal. I think it’s more a convoluted way of making them be cute and amusing together and I’m totally ok with that. Katrina has also figured out how to communicate with them through a mirror (I know, she’s actually learned how to do something useful. I was shocked as well). Of course she’s contacting to tell them that she failed to kill baby!Moloch. Ichabod, hilariously, says they could use her input but Katrina has to shut down communication before she’s forced to do something that’s actually useful. Abbie’s facial expression says it all. So she’s learned to communicate, but it’s only to say “Ichabod! I have failed to do anything useful!” Oh Katrina, we kind of assumed that already (Abbie certainly did). As an extra bonus, after Katrina magicked the mirror, Henry can now use it to spy on Abbie and Ichabod. Oh Katrina, please stop helping which means he gets to listen in to Abbie and Ichabod coming up with Enoch’s Sword as a weapon to use against Moloch. Abbie also gets a note that Reyes is co-ordinating the search for the newly escaped Frank – who Jenny is driving to Canada. Abbie sends a warning to Jenny: cut to them driving and having a moment about safety, Frank’s soul and his family. They run into a checkpoint and Frank gets out the car and arranges to go round on foot – refusing to get Jenny into further trouble. But once he is out he doesn’t meet up with jenny and instead sends her a message saying he intends to hide and fight back – he refuses to run. Anyway back to the sword, by sheer coincidence this Sword of Enoch (aka the Sword of Methuselah) has made its way to the local area (because just about every Biblical artefact was shipped from the Middle East to New England at some point) and through a few deductive steps and clues, Ichabod and Abbie discover where it is buried. Also they have the cryptic warning that they will die if they don’t know themselves completely. Of course all of this is now known to Henry (thanks Katrina!) who dispatches Abraham to find the sword (though he worries about the coming dawn). Abraham is also all stroppy with Katrina since she’s reached out to Ichabod and proven that her newly declared love to him is all false. Well done, Katrina, your deception lasted 2 episodes. You tried. Abbie and Ichabod make it to the location and Abbie recognises it from one of the dreams she had of her mother –her mother trying to guide her. Abraham arrives and they both watch him going for the sword, Ichabod wants to wait for the dawn but Abbie thinks he could get the sword before that and charges in. The horseman nearly finds Abbie but Ichabod distracts him – and the sun comes up. Toasty horseman has to run. For some reason we have a random flashback to Ichabod and Abraham back in the old days and Ichabod declaring how their fates are intertwined and revealing that Abraham was the reason he came to America in the first place. This is all part of the rather convoluted “know yourself” prophecy since Ichabod describes how Abraham and Katrina basically influenced his every decision. This leads him to doubt himself because he has been manipulated for so long while Abbie is all certain in her newfound purpose and role. They turn and run out of the tunnels, managing to close the door on a snake fanged woman chasing them. Yup, a gorgon. Greek myths have also made the trip across the Atlantic in that Biblical artefact ship. 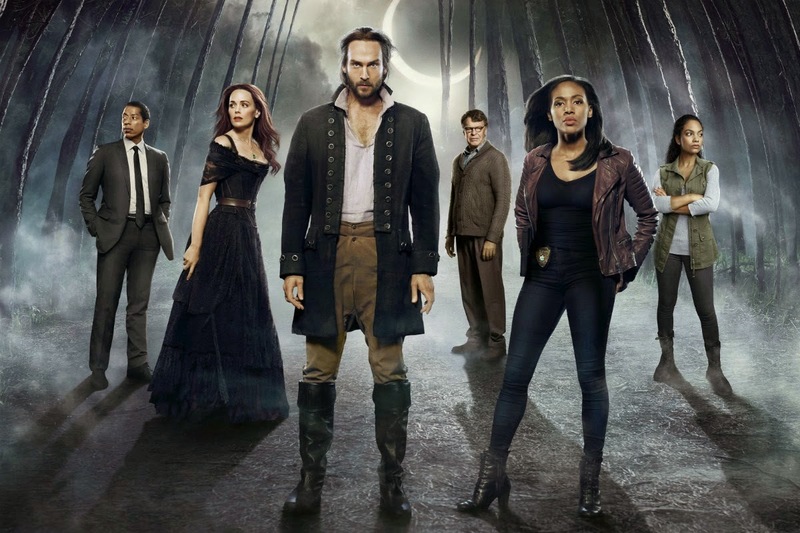 Ichabod expositions about the gorgon and some historical babble while Abbie is far more concerned that yet another of her ancestors died young on this mission. Abbie considers the whole “know yourself” prophecy and decides a far better option would be to let the Horseman – who doesn’t have eyes – retrieve the sword. Back to team evil and Henry has a new toy – a shofar, and this particular horn is used to herald all kinds of worrying things. Henry mocks Katrina for her inability to poison Moloch (because she’s useless. And his knowing about her attempt also means she now officially fails at the whole spy/infiltration thing as well) who is aging so rapidly he has become a surly teenager. Henry rants out some of his mummy issues (and also reveals to Katrina that her talking to Ichabod allowed him to spy just so she knows how terrible she is) and uses magic to reveal what Surly-Teen-Moloch actually looks like (which we don’t see). Over to Ichabod and Abbie (actually doing something) and after one of their little fun moments the horseman arrives. They stay out of his way while Abraham and the gorgon fight, sneaking past them to find the sword. When they get to the main room, though, a dozen swords await them (some of them are obviously in styles that are far too modern to have been Methuselah’s blade though… and by some, I mean all). Meanwhile Abbie picks a sword and they all turn into snakes. I take it that’s the wrong sword. Ichabod joins her because Abraham drew a gun which is rather unsporting (this means while Ichabod and Abraham were fencing and arguing Abbie was just kind of walking around the swords). No sword, but they do get a gun wielding Abraham – but he decides to leave when Henry blows his herald-of-the-end-times shofar. Abraham rants and confronts Ichabod a bit before leaving because DRAMA. Gorgons. Really? We’re hitting Greek mythology now? And the messages of this episode were waaay overdone in the cheesiness. “What do we have that all those out there didn’t have?” “each other”. Uh, no – you had a headless horseman who couldn’t be turned to stone by a gorgon’s gaze, remember? They never got to the chamber, hence why their statues are out there. And “each other” how heavy are those torches? You couldn’t lift one with each hand? Stop trying to hard! We get it, the witnesses work together and Abbie and Ichabod are awesome together, stop dropping hitting us with sledgehammers of subtlety. Y’know sometimes you get stories with the comedy sidekick? Someone so utterly inept and awful that every time they help disaster is bound to follow and we’re all supposed to point and laugh? Well, I think that may be Katrina’s intended role because I have no other explanation for her. She’s not just comically useless – but she is an active hindrance to Crane and Abbie. If they could get her to switch sides she would do far more damage to Moloch’s plans just by trying to HELP him. While I wish we saw more Jenny and Frank this episode I like that Frank hasn’t run – that suggests they’re at least going to try and keep him around a little more.